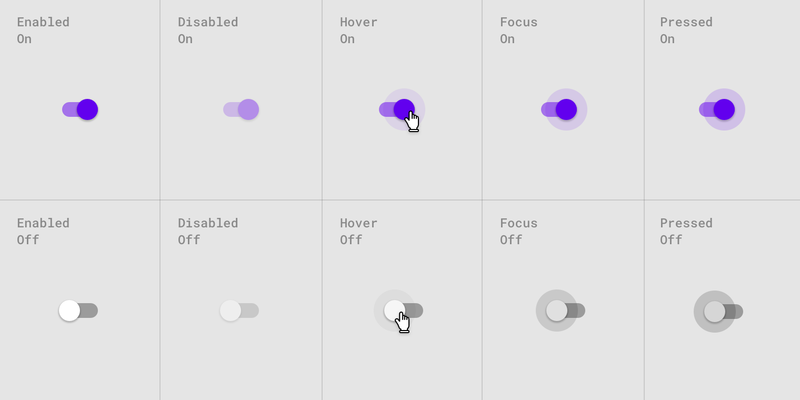 I'm designing a ToggleButton control that has the ability to be in a locked state in which user interaction will not be able to further toggle the control. In general I would like the button to appear somewhat natural in the natural scheme of rules laid out in Microsoft's UXGuide but I don't mind the idea of using some sort of custom graphic or unique concept to signify fact that the control is locked. An iPhone style ON/OFF toggle button. A toggle button featuring a custom graphic icon such as a power button that lights up when activated. A plain old Check Box. If I'm to go with a check box I could use the disabled state to represent that the control is locked however this may look to the user as if the control's setting isn't in effect since it normally appears muted via a grayed out style. For the other two options, the only reasonable thing I can think of is to overly some type of padlock style icon on or near the toggle button when it is locked. If somebody can lead me in the right direction it would be greatly appreciated. Proposal#1: Below is a concept that I came up with that I think looks somewhat similar to the iPhone toggle but which was inspired by the power button my Wii console. Also I incorporated the suggestion by Hisham to only show the padlock icon when in a locked state. This concept is more specific to toggle button that represnts on/off states but for that purpose I think it appears quite adequate. 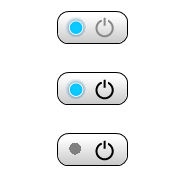 Proposal#2: This is another take on the example above but uses the ubiquitous power icon instead of the on/off text. Additionally I used a grayed out text instead of the padlock to signify that the control is on but cannot be toggled any further. Note, I have seen some cases where the line that intersects the circle in the power symbol changes it's position depending on whether power is on or off however I cannot dig up any examples of this right now. UPDATE: Since sometimes context is everything, I created a rough but more specific mockup to show how the toggle control I'm developing will be used. In general I would like be able to apply some of the concepts we develop here to other more common user interfaces but I figured I should at least elaborate further on what is leading more twords hardware style buttons. In the long run, whether I'm going to emulate a hardware look or not the important point is that this toggle control will be repeated in many places and will serve an identical purpose thus perhaps in some cases a specialized toggle control like the one I've proposed would be a good solution otherwise in some cases perhaps a more traditional UI one could use two radio buttons for the ON and OFF states and then use a label to explain or just disable these controls when they are to be in a locked state. From this example one can see why I'm also moving away from the padlock metaphor as well since placing a padlock icon on the on/off toggle button may mislead the user into thinking the whole control is locked which would not be the case. The locked/disabled state is only supposed to affect the ability to switch the effect control on/off. On; user may turn it off. Off; user may turn it on. If you show a button on the control (even if disabled), you're implying to the user that they might be able to change the value - in many applications, disabled buttons can be enabled by some other action, for example a "Save" button that is only enabled once a field has been modified. So, I suggest only showing the button if the state is under the users control. When state is locked, don't show any button at all - just show the current state. I've shown padlocks here, in line with your original thinking, but I think they may be redundant as the lack of a button makes it pretty clear the state can't be changed. I would recommend the approach of showing a padlock icon, but not as an overlay. Instead, I'd put it next to the control. For the iPhone-style ON/OFF toggle button and checkboxes, it can go on either right or left. If the padlock icon needs to appear only to indicate lock status, i.e. the user cannot click on it to unlock, then I recommend that it not be shown at all when the control is not locked. I agree with Rob Allen's point. Your challenge is to recreate a four state choice field with a metaphor typically associated with two choices. A radio button type metaphor (where mutual exclusiveness is reinforced) may be more comfortable for users since this metaphor type supports an nth state choice field. However if the button is something you want to stick with maybe a slightly more radical visual representation of the locked state is necessary? Perhaps pairing the padlock icon with a red button border? This way the states ON (w/ LED) and ON LOCKED (w/ LED and red border + padlock) are different enough to strongly suggest two states. Ditto with the OFF states. You currently have 3 4 states for your button which are logically paired, on, off in one group and locked(on) and locked(off) in the other. With your push button metaphor and labeling, you are hinting at only 2 of those states, off and on. That means that I have no idea that a locked state could be waiting for me in my future. Once a user stumbles on that, they may remember that but a new user will not expect a locked state. Also, if a user first encounters this control in its locked state (before seeing the power icon or an on/off label) they may not get the purpose of the control. Instead of trying to map a push-button style control (2 natural states), you can use a different metaphor which is more conducive to multiple states, like a sliding switch, knob, or dial with labels over the meaningful positions. In response to your comments, I disagree that you have a checkbox as your underlying metaphor because your 2 sets of states are mutually exclusive; i.e. you cannot be off AND on or OFF(Locked) and On(Locked) at the same time. I believe your underlying metaphor is instead a pair of radio button lists or, a radio button and checkbox for the locked state. To try and represent all of that in a single button and still be usable and discoverable sounds like too tall an order. I know this question is old, but I saw it hasn't an answer. 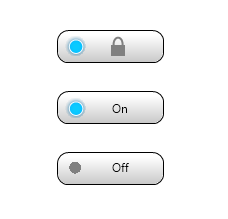 I think for on/off it should be used a simple switch button and for the locked state, the button should be disabled. More examples: Material design - Selection controls. I would use a toggle switch, and graying it on the locked state. It doesn't suffer the problem of the command vs state problem. Imagine you have a media player with a Play/Pause button. When you display the Play icon on it, is it the command or the state? 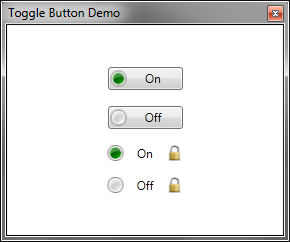 This is a common issue on two-state toggle buttons. It clearly displays the State. The command and the state are on overlapping positions, so you don't suffer the previous problem. It works well with mobile. Android and iOS have plenty of them. Even Windows 8 for desktop has its own version of them. Being gray is almost a convention of a disabled thing. And you will respect the design principle of visual inertia. You can argue that I should not rely on color, and that's right, so put a key/padlock/slashed keyhole icon on its slider. Not the answer you're looking for? Browse other questions tagged gui-design toggle wpf or ask your own question. How do I communicate the absence of settings?